The scenic beauty of the Blue Ridge Mountains is unmatched by that of any other area of the country. With their sweeping landscapes and soaring slopes, these breathtaking mountains draw visitors from all over the country to our Vacation Rentals in Western NC. Our Western NC Cabins are centrally located so that our guests will have the opportunity to visit all of the best Western North Carolina Attractions without spending hours in their vehicles. Many visitors to our Rental Cabins Western NC like to enjoy the natural beauty of our Western NC Cabins’ surroundings by playing a round or two of golf. Those visitors are in luck, as our Cabins Hot Tub Western North Carolina are near some of the area’s greatest golf courses. Linville Falls Mountain Club and Mountain Glen Golf Club are two golf courses near our Cabins on the Blue Ridge Parkway where golfers can enjoy spectacular scenery and challenging holes. Linville Falls Golf Club is located approximately 8 miles south of our Rental Log Cabins on Highway 221. 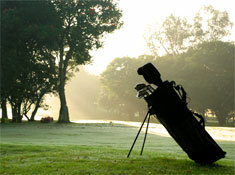 Linville Land Harbor Golf Club is located located 8 north with Sugar Mountain Golf approximately 14 miles north. The Linville Falls Mountain Club and Preserve, only seven miles from our Western NC Mountain Cabins Rentals, was hailed by its designer, Lee Trevino, as “the most gorgeous piece of property” he had ever seen. This eighteen-hole public course boasts not only sweeping views of the beautiful mountains that surround it, but food, a pro shop, carts, a bar, a driving range, a chipping green, and a putting green. The 71-par course with a slope rating of 128 has recently undergone a restoration, making the 6,581 yards at the Linville Falls Mountain Club an even better place to spend a day of your stay in our Blue Ridge Parkway Cabins. This course is open year round, so no matter when you visit us at our Western NC Cabins Rentals, you’ll be able to enjoy an amazing round of golf on one of the most beautiful locations in the country. Located in Newland, just eight miles from our Linville Gorge Lodging, The Mountain Glen Golf Club has been delighting visitors with its scenic vistas and imaginative holes since it opened in 1963. A favorite of locals and visitors alike, the 18-hole course is operated by the Avery Development Corporation, and was designed by George W. Cobb, ASGCA. With 6,723 yards of golf and a par of 72, the mountain views this course offers keep visitors returning time and again, and the terrain lends challenge as well as beauty to this golf course near our Cabins in Pisgah National Forest. Featuring a club house with dining facility, a pro shop, a snack bar, a driving range, a golf shed, and a putting green, Mountain Glen Golf Club is an ideal place for golfers staying at our Rental Cabins Western North Carolina to play a round of golf. What better way to spend part—or even all—of your stay at our Rental Cabins Western North Carolina than strolling on the links of either of the two gorgeous golf courses that are just miles from our Linville Falls Lodging. After a long day of golf, return to our Cabins Hot Tubs for Rent Western North Carolina and relax in the hot tub on your deck, or cozy up by the fireplace with your family or friends. Our Linville North Carolina Cabin Rentals Lake River Creek Pond are the perfect home base for a Fly Fishing North Carolina vacation and are ideally situated for those looking for a North Carolina Hiking excursion. Close to all of the best Western North Carolina Attractions, including Grandfather Mountain NC, Biltmore Estate Asheville, Linville Gorge North Carolina, and Linville Caverns NC, our Rental Cabins Hot Tub Western North Carolina are the ideal location for a Western North Carolina getaway. There are many overly commercialized Hotels Linville NC and Linville NC Motels in our area, but only our Linville North Carolina Cabin Rentals Lake River Creek Pond are located just yards away from the Linville River and are close by all of the best Ski Resorts in North Carolina, the best Linville NC Attractions, exciting NC Golf Courses, and dozens of other activities that can be enjoyed all year long. Our Western NC Mountain Cabins Rentals are surrounded by hundreds of North Carolina Hiking opportunities and Fly Fishing North Carolina hotspots, as well as Western North Carolina Attractions like Biltmore Estate Asheville, Gem Mines NC Linville, and Linville Falls, Linville Gorge NC, and Linville Caverns. With innumerable Things to Do in Western North Carolina and unlimited ways to enjoy the outdoors, our Cabins on the Blue Ridge Parkway are ideal Linville Falls Lodging for almost anyone who enjoys nature.